We were delighted when Heathrow asked us to help deliver their ‘Take Onboard’ service, which launched the 1st week of January 2017. 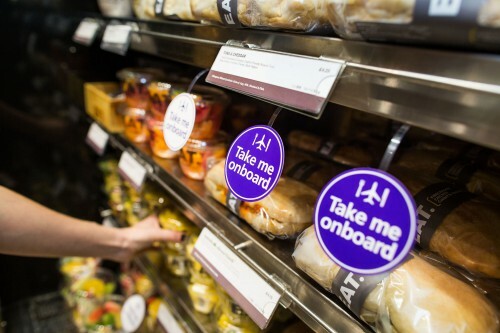 The look and feel of the Take Onboard identifier needed to be on brand, eye catching and simple to promote the new service with the participating food retailers within the Terminals. The suite of collateral included Digital Animation for live screens and website, Strut Cards, Shelf Wobblers and Table Cards. 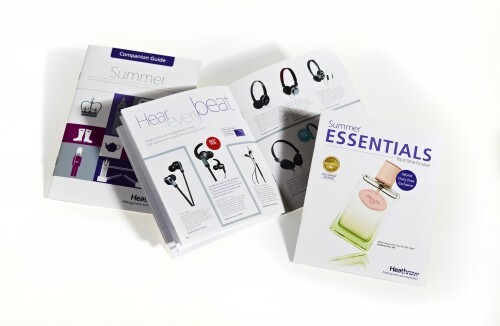 When Heathrow asked us to take a fresh look at their terminal retail guides we were thrilled. Each edition has four slightly different versions, tailored to the products available in each of the terminals. 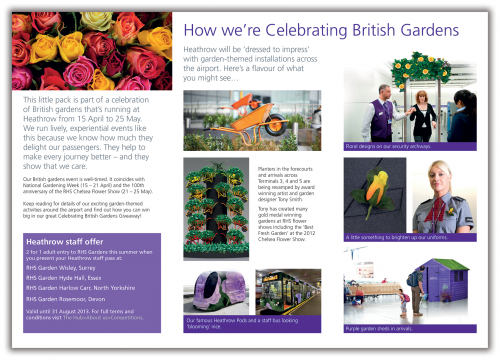 SHOWCASE, is a bi-monthly 34 page guide highlighting some of the many delights available at Heathrow. With more than 75 big brand shops and over 40 places to eat there’s certainly a lot to ‘showcase’ to passengers. So far we’ve completed the Sept/Oct edition and the Nov/Dec Christmas special featuring hundreds of great gift ideas. 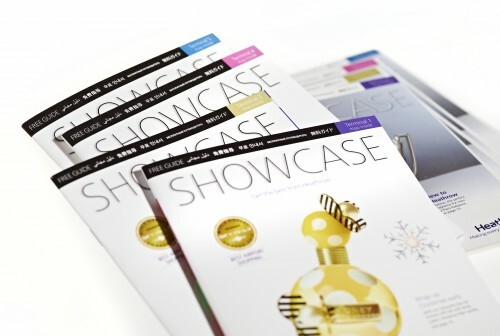 The Showcase suite also comprises of Summer Essentials – a 12 page glossy guide, packed full of savings on last-minute holiday must-haves. The summer edition of the Companion Guide – an eye-catching, 24 page, insider’s guide to what’s on in London in August. And the Technology Guide – an in-depth guide to the latest tech trends, featuring a combination of editorial and product information. We can’t wait to get started on the next one! 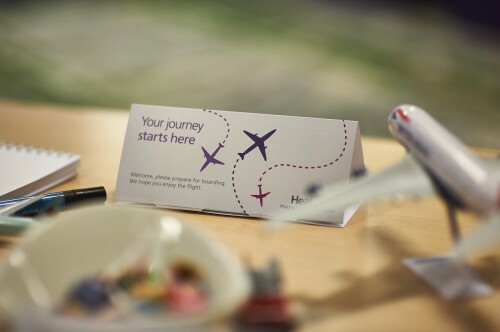 Heathrow has commissioned Creative Triangle to design and install an induction room for all new operational employees at the airport to make sure that they have an excellent understanding of Heathrow’s vision and brand. Central to the induction room is a large ariel view of the airport printed onto a carpet with moveable 3D buildings (terminals, control tower etc) and props including airplanes, police cars etc. 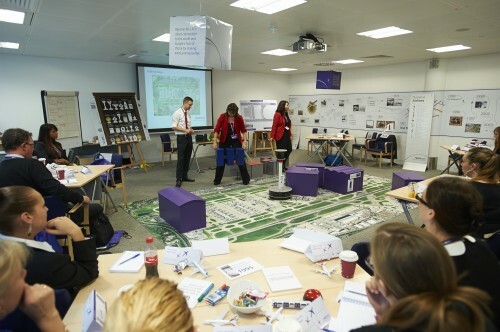 This floor activity has many uses – it encourages inductees to ‘take their shoes off’ and get involved, it works as a simple familiarisation tool and it clearly shows what makes Heathrow. To break up the training sessions there are several interactive magnetic games around the room – encouraging inductees to consider components that make up the airport; retail, airlines, partners etc. There is a timeline printed onto the walls travelling around the room that depicts Heathrow’s journey of development – designed to enthuse and excite. To encourage inductees to put the passenger at the heart of everything they do we created a passenger profile game using shoes to represent the different passengers, such as business, connecting, families etc. Having a clear, detailed and easy to use welfare response plan at Heathrow is imperative, making sure that eventualities are covered and everyone knows their role, actions and responsibilities. We have just finished designing and artworking this 174pp A4 folder. Michelle Smith, Head of Passenger Welfare at Heathrow, described the file as ‘being key to Heathrow’s planned welfare response during major disruptions such as extreme weather conditions’. Michelle added that they are ‘really happy with the result and were impressed with Creative Triangle’s dedication to the project’. Heathrow have planned many passenger facing events across the airport this summer. 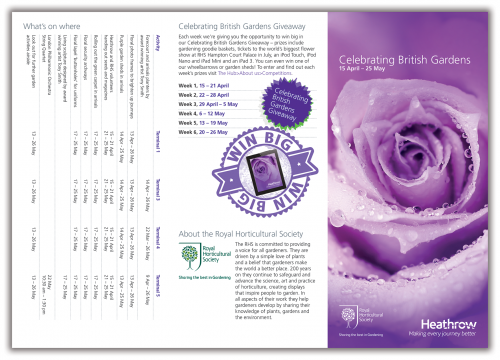 For the first event they have teamed up with the Royal Horticultural Society to promote the National Gardening Week and the Chelsea Flower Show. To involve the staff, we have been asked to come up with an internal campaign which makes them feel part of the celebrations and helps them embrace the passenger event. We have designed a 6 page DL leaflet with key event highlights and staff offers, a competition postcard to win an iPad by designing a flowerbed and an activities postcard and envelope aimed at children to engage the staffs’ families, for example how to make your own bird feeder and how to make plants from food. 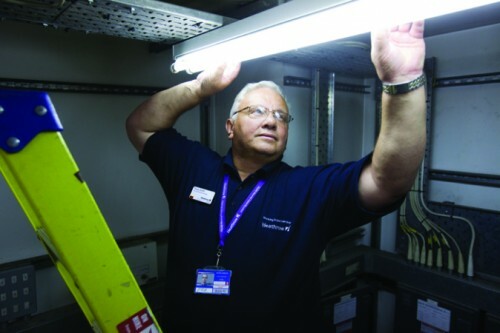 Creative Triangle have helped develop the standards for airside internal communications at Heathrow. There are close to 80,000 people working at Heathrow and many of them are responsible for airside operations. To ensure all of those who work airside receive consistent communications, we have developed design guidelines and content managed and produced literature used in staff training and awareness campaigns including brochures, maps, posters, z-cards and many more. 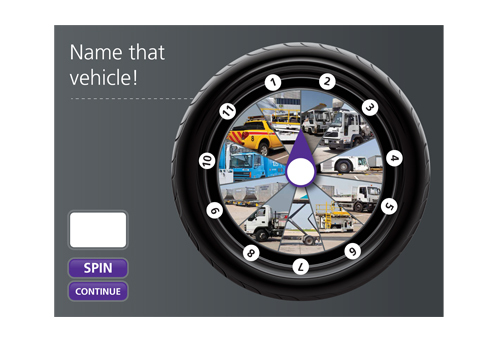 With so many employees having the responsibility of driving a host of different vehicles airside, we were asked to produce an interactive and challenging piece of communication that could be used in staff training programmes. Every person who drives airside needs to complete a test and also needs to re-sit that test every five years. Heathrow’s concern was that the staff training was not consistent and needed a pack that could be given to trainers allowing them to offer a consistent approach to the test. The result was to produce an interactive DVD with notes that contained a film covering all of the major health and safety factors that arise whilst driving airside. 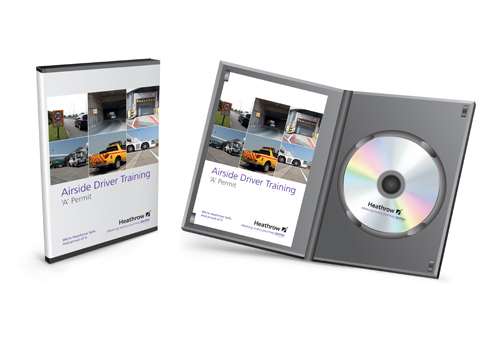 We conceptualised & programmed the training DVD which includes short videos filmed onsite and interactive training aides which complement and reiterate the information in the videos and allow the participant to engage with the trainer in highlighting possible problems that could arise whilst driving airside. The short videos are categorised making it easy to navigate through the information. The training aides are a fun, interactive way of recapping on important key points discussed in the videos. What would you swap yours for? 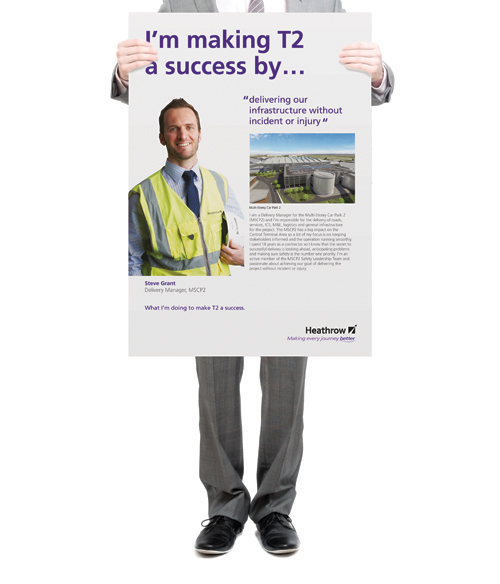 During the sporting summer an integrated marketing campaign encouraged 2,500 Heathrow employees to suspend their car park pass for two months, enabling the airport to prepare for an unprecedented increase in staff levels and to reduce the pressure on staff car parks. Creative Triangle worked with Heathrow Commuter, part of the airport’s sustainable transport team, to create a simple and effective campaign that could convince Heathrow employees to choose an alternative way to travel to work. The ‘Car Park Pass Swap’ – a scheme through which staff could suspend their car park pass for two months in return for £200 worth of fuel, a £200 cycle voucher, a Heathrow Travelcard for the bus network or a zones 3–6 Oyster card for the London Underground was the basis of the marketing campaign. The communications strategy was based on the support of multiple stakeholders and communications channels across the many companies based at the airport. Using multiple mediums such as posters, leaflets, adverts for external and internal newsletters, the airport newspaper to support a monthly column, as well as the Heathrow Commuter website, outdoor advertising at car park bus stops, direct mail and emails. 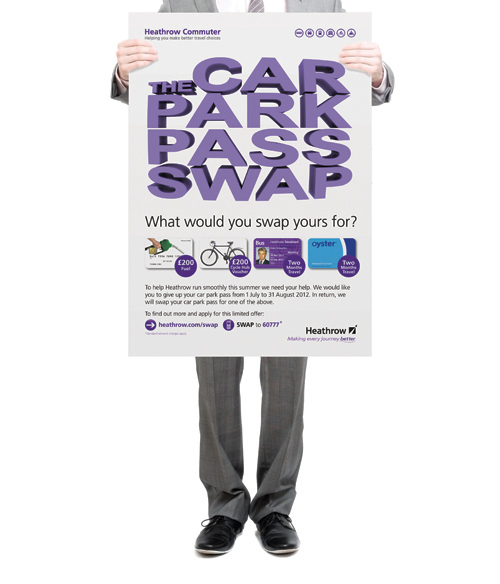 The campaign was able to achieve maximum awareness, consideration and ultimately a conversion to scheme members, with a simple graphic of ‘Car Park Pass Swap’ which creatively provided a visual thread throughout all the reiterations of the campaign posters (we extended the scheme closure date twice), multiple emails to existing employee member driven databases and eventually a ‘recommend a friend’ competition which provided just under 10% of the overall successful applications. Over 4,500 employees applied for the Car Park Pass Swap scheme and just under 2,500 car park passes were suspended meeting Heathrow Commuter’s target and keeping staff car park capacity stable during the sporting summer. 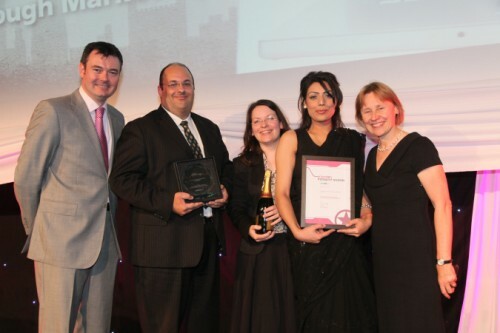 We would like to congratulate our client, Heathrow Commuter for their recent success at the London Transport Awards. 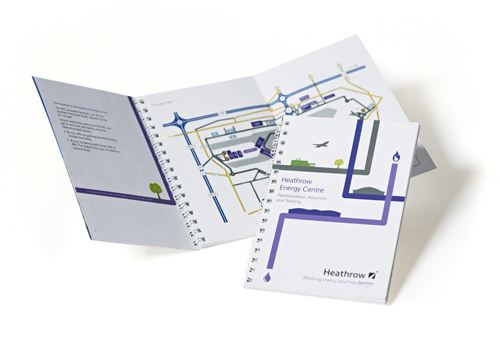 Heathrow Commuter, Heathrow’s airport sustainable travel team, won the Excellence in travel information and marketing award for their Save 75% off Heathrow Connect campaign – for which Creative Triangle designed the supporting material. The campaign was described by judges as having ‘impressive results from a comprehensive marketing strategy’. We have just helped to launch a new channel for marketing messages to staff at Heathrow Airport. We have designed, produced and installed contemporary notice boards in four high volume areas for staff at two locations. 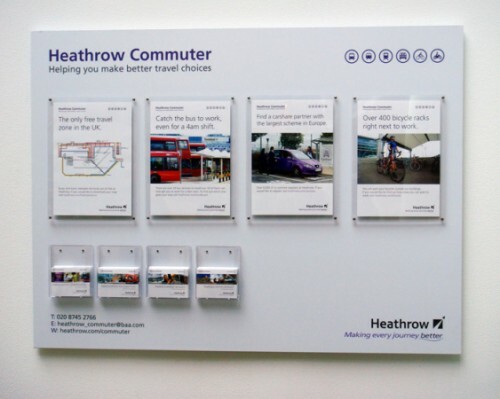 The notice boards have been designed to be updated on a regular basis with Heathrow Commuter’s (the airports sustainable travel team) current marketing campaigns – they also have the facility to display leaflets for staff to take away. They were installed a couple of weeks ago and as a result of lots of high level praise (‘they’re so clean, modern and on brand’) we have already been commissioned to roll them out across the rest of the airport– success all round! Having been working with Heathrow Airport since the start of its ‘Heathrow Commuter’ scheme, we’ve made real progress in encouraging a high percentage of its 76,000 employees to choose a more environmentally-friendly way to travel to work. 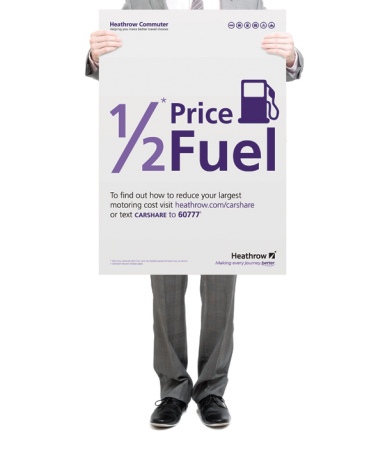 Our latest campaign offers Heathrow employees a massive 75% off Heathrow Connect Rail fares, which is a great incentive. This campaign has involved posters, direct mail, bus posters, website updates and e-shots. Watch this space to find out how effective this campaign was! Following the success of the tender pack project for BAA, we were commissioned to design a piece of marketing material to promote Expo, a dedicated programme of unique and inspiring installations that will capture the imagination of Heathrow Airport’s passengers and enhance their journey throughout the terminals, providing an unexpected extra dimension to their travels. As well as displaying inspiring and thought-provoking content celebrating the best of the UK, Expo showcases events and experiences tied into the national and global calendar. Some Expo spaces are allocated footprints in Terminal 5, both before and after security. Other installations may be more integrated into the terminals to create a multi-touch point experience or an element of ‘wow’ factor. In order to promote the use of this space to Heathrow’s target audience, which included charitable, artistic, cultural or sporting based organisations supported by commercial sponsors, we designed a sophisticated brochure which replicated a high end art / museum catalogue to showcase this space and the opportunity available. We selected a catalogue size to encourage the targeted user to read more and get involved. 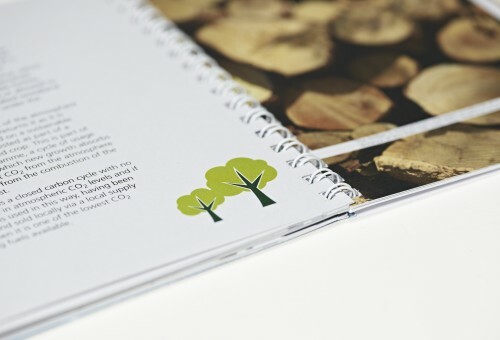 The final brochure was 391mm x 300mm and was digitally printed on uncoated stock. 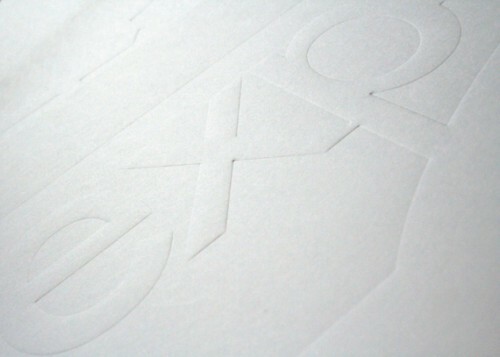 The Expo brand was subtly de-bossed to the front cover which created a stylish and timeless design. The brochure was posted to a specific target audience and has achieved highly effective results.